With rich sounds, layered harmonics, and lavish production values, Hysteria is one of metal's all-time best selling and most well known albums. Aimed with laser precision at the commercial market, with no less than seven singles released to propel the album into the sales stratosphere, Hysteria is the pinnacle of Def Leppard's commercial success, and another masterpiece of sound quality from producer Robert John "Mutt" Lange. Released a long four and a half years after Pyromania, an interval that included the band rallying around drummer Rick Allen after he lost an arm in a car crash, Def Leppard had to get Hysteria right or the music world could have easily passed them by. With a unique combination of pop, rock and metal mixed into a grand concert hall sound, the band caught the moment when metal was peaking into mainstream popularity. More serious - and much better - than glam, but not as dark nor as dangerous as traditional metal sounds, Hysteria occupied the brawny but non-threatening spot where both the boys and their girlfriends could enjoy the music without shame. Three libido-fuelled tracks became huge hits for the band: by the standards of pop radio broadcasting to the impressionable masses, Animal, Pour Some Sugar On Me, and Armageddon It were lustfully dangerous and therefore highly desirable, but represent the relatively weaker and less interesting selections on the album. The ballads are more successful, Love Bites and Hysteria both benefiting from the earnest scratchy soulfulness of Joe Elliott's vocals, Hysteria bouncing on a thoughtful riff and Love Bites building to a climax of agonized emotion. The best material comes right at the front, Women and Rocket a powerful combination to reintroduce the band's identity. Women quickly settles into a spacey, prosperous groove, the power building gradually around Allen's drums until guitarists Clark and Collen unload their riffs in a remarkable show of controlled dominance. With Elliott belting Skin on skin / Let the love begin / Women! to unleash the solos, Def Leppard announced that they are definitely back. Rocket is more ambitious, the band fully exploring where complex harmonics will take them, literally and musically into orbit. 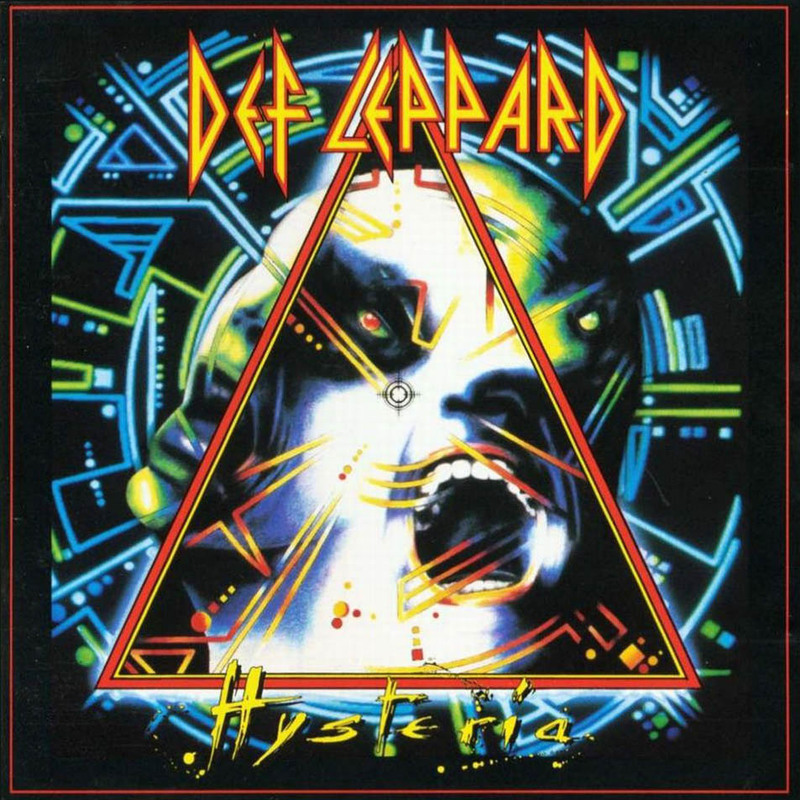 Hysteria does go on, Def Leppard keen to make up for the lost period of productivity preceding the album, but the final two tracks are more tiresome than necessary. The content overall may be less impressive than the reputation, but Hysteria marks a moment in time when metal packaged itself to dominate the airwaves -- and succeeded. Engineered by Nigel Green. Mixed by Nigel Green and Mike Shipley.